If you’re one of us who cannot eat a huge amount of ‘animal protein’ but run around a lot and need heaps of energy, then this dish, a variation on the onion bhaji theme, may be for you. We make a big batch of them to use in sandwiches, as burgers, and as a main meal the first night they’re cooked. 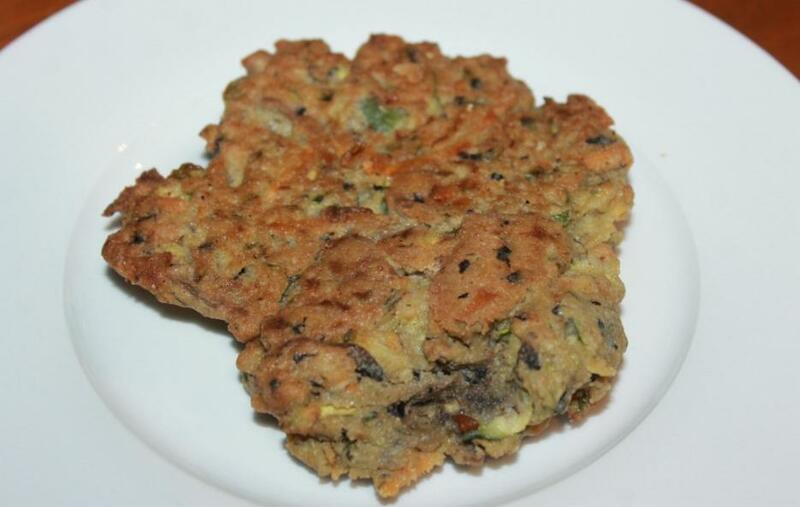 These are a more substantial form of Pakoras, which are also made with Besan flour. You can alternate the vegetables to suit what is seasonal or your own tastes. Making up a batch of onion ones at the same time for those who prefer the traditional recipe will keep everyone happy. Chickpeas are high in protein and Australia is the world's second largest producer of these behind India. They are an excellent source of essential nutrients such as iron, folate, phosphorus, protein and dietary fiber. Chickpeas are also low in fat and what they do contain is polyunsaturated. There has also been some research that has shown that chickpea consumption may lower blood cholesterol. Put oven on to 180 degrees and two flat trays in at same time to heat up (this will keep bhajis hot while you cook others – it is also a way to shallow fry them and finish off cooking process in oven, minimising oil use). Place all your prepared vegetables in a bowl, add in the Besan flour and mix so all ingredients are coated. Add your wet ingredients – when adding the water you want to form a sticky fairly thick mixture otherwise you will have problems flipping the Bhaji. We only shallow fry these rather then deep frying so we get the taste of the vegetables and besan flour instead of the oil predominating. Heat a frying pan and place about 1cm of oil in. Dollop a tablespoon of mixture in and allow to flatten slightly; stir with spoon to flatten if required. Allow to brown and then flip. Once other side has browned, place on your heated tray in oven to finish cooking and begin next batch. Continue this process until all are cooked. Serve with a nice crisp green salad and fresh hot bread. Break the tamarind into small pieces and soak in boiling water for one hour. Mash it into a pulp and strain, pressing the tamarind into the strainer to remove all the pulp. Add sugar to the pulp. Mix well. Add the remaining ingredients. Mix and taste. Add more sugar, salt or pepper as needed. Chutney can be refrigerated for two to three months. Tamarind chutney is delicious with samosas, pakoras, and bhajis. Stir together the cucumber, yoghurt, lemon juice, mint, sugar, and salt in a bowl. Cover and refrigerate at least 3 hours, preferably overnight. Sift the flour, chilli, turmeric, cumin, baking powder and salt into a large mixing bowl. Add the chopped coriander, onions and chillies and mix well. Preheat the frypan and add oil. Gradually add enough water to the flour mixture to form a thick batter, mixing very well so the onions are well coated. Very carefully drop spoonfuls of the mixture into the hot oil and fry until golden brown. Drain well on paper towels. Keep warm whilst you cook the remaining bhajis on your oven trays. Serve hot. The chickpea (Cicer arietinum) is a legume of the family Fabaceae, subfamily Faboideae. Its seeds are high in protein. It is one of the earliest cultivated legumes: 7,500-year-old remains have been found in the Middle East. Other common names for the species include garbanzo bean, ceci bean, channa and Bengal gram. The name "chickpea" traces back through the French chiche to cicer, Latin for ‘chickpea’ (from which the Roman cognomenCicero was taken). The Oxford English Dictionary lists a 1548 citation that reads, "Cicer may be named in English Cich, or ciche pease, after the Frenche tongue." The dictionary cites "Chick-pea" in the mid-18th century; the original word in English taken directly from French was chich, found in print in English in 1388. Domesticated chickpeas have been found in the aceramic levels of Jericho (PPNB) along with Cayönü in Turkey and inNeolithic pottery at Hacilar, Turkey. They were found in the late Neolithic (about 3500 BCE) at Thessaly, Kastanas, Lerna andDimini, Greece. In southern France Mesolithic layers in a cave at L'Abeurador, Aude have yielded wild chickpeas carbon dated to 6790±90 BCE. By the Bronze Age, chickpeas were known in Italy and Greece. In classical Greece, they were called erébinthos and eaten as a staple, a dessert, or consumed raw when young. The Romans knew several varieties such as venus, ram, and punic chickpeas. They were both cooked down into a broth and roasted as a snack. The Roman gourmet Apicius gives several recipes for chickpeas. Carbonized chickpeas have been found at the Roman legion fort at Neuss (Novaesium), Germany in layers from the first century CE, along with rice. Chickpeas are mentioned in Charlemagne's Capitulare de villis (about 800 CE) as cicer italicum, as grown in each imperial demesne. Albertus Magnus mentions red, white and black varieties. Nicholas Culpeper noted "chick-pease or cicers" are less "windy" than peas and more nourishing. Ancient people also associated chickpeas with Venus because they were said to offer medical uses such as increasing sperm and milk, provoking menstruation and urine and helping to treat kidney stones. "White cicers" were thought to be especially strong and helpful.